The Vest is constructed of soft knit and polyester loop fabric. It pulls easily over the head and elastic straps secure the vest and allow for flexible size adjustments. The Vest is available in sizes, small, medium and large. 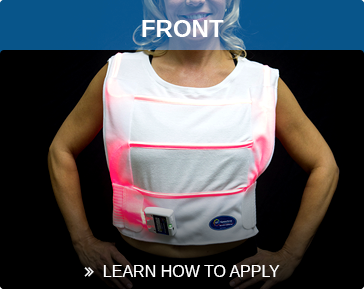 The Vest is designed to treat neck, chest, shoulder and back pains, which may be caused from bronchial asthma, COPD and other respiratory conditions. It improves circulation direct into the lungs from the front and back to strengthen muscles to support the spine providing a charge of energy to acute and chronic conditions along with giving athletes a charge of energy by improving oxygenation of the blood supply.